I like to start by asking, what brought you to comics? When I was young – like pretty much every kid – I loved drawing and telling stories. However, the only comics I knew were superhero comics, and as a girl I got a strong impression that they weren’t meant for someone like me. Luckily, in high school I stumbled upon The Sandman. That series had the level of storytelling, nuance, and intelligence that I got from novels, but it had also had amazing imagery! After high school I went to the School of Visual Arts in NYC and studied cartooning there, started my webcomic Strong Female Protagonist, and have been in the comics world ever since. So what is The Witch Boy? The Witch Boy is my middle grade debut graphic novel! It’s the story of Aster, a young boy growing up in a family where everyone has magic. All the women are witches, and all the men are shapeshifters. Aster, despite his family’s tra dition, is a witch. He sneaks into the girls’ classes, secretly teaching himself witchery against his parents’ wishes. 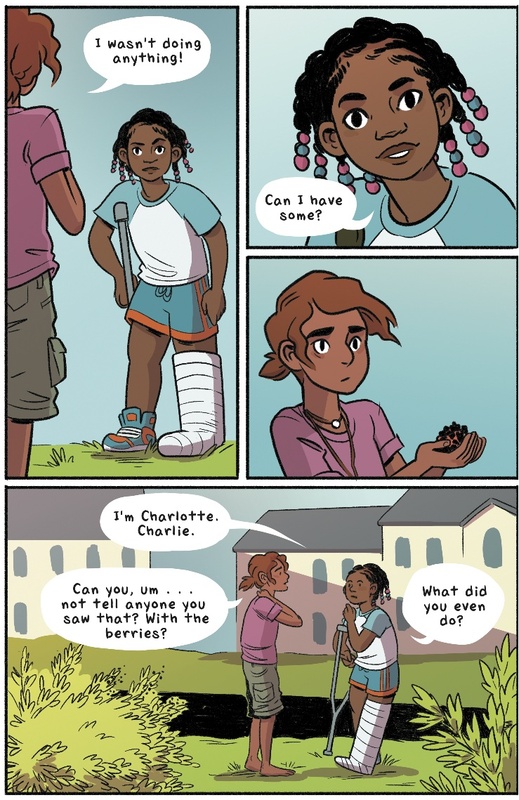 When boys from the family start disappearing, only Aster and his friend Charlie, a tomboy from the non-magical suburb nearby, can figure out what’s going on. Can you talk a little about the background and this world and how magic works. 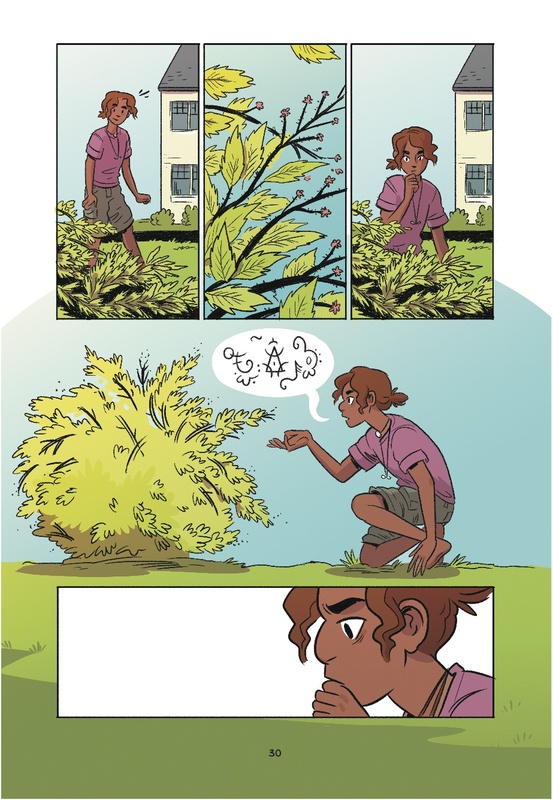 I’m exploring an aesthetic I really love – grounded, nature-based magic largely set in the real world. Aster’s family is an anomaly, living in the forest in a big old mansion, but around them the world goes on as we know it. They keep the tradition of magic within their family. A lot of it is based around magical runes, which are fun for me to design and draw! When I was a teen I went to a live action roleplaying summer camp in upstate New York, and my favorite adventure games were in this kind of fantasy setting – we’d wear our normal clothes, but carry around wands and spell books. Something about that is really fun to me and I’ve enjoyed drawing it for this book. I started SFP with my best friend Brennan Lee Mulligan when we both were itching for a way to express ourselves creatively. I love working with him on that project, which is ongoing, and because of it I got jobs where I was the artist half of an artist-writer team. At a certain point, however, I found myself going back to my old stories and wanting to draw them. I had to gather a lot of self confidence to make that leap, but I’m glad I did. Writing a script for yourself is such a gift – I wrote so many things I was excited to draw and avoided things I don’t like drawing as much (there’s approximately one car in the entire book, for example). You can achieve amazing things working with a writer, but there’s something really special about holding a graphic novel and knowing that every single line in it is yours. What was the process of working on this book like, because you are working on so many other projects? Is this something you’ve been working on for a while? I wrote the first draft of the script when I graduated SVA in 2014. It took a while for me to feel confident enough to pitch it. It was picked up by Scholastic in 2016 and took me a bit less than a year to draw. I always have a lot going on – besides this and Strong Female Protagonist, I work on the Disney show Star vs. the Forces of Evil – but I like it that way. When I get bored of one project I can jump over to another! In the past few months I’ve been working on another graphic novel, SFP, a short comic, a novel, a D&D campaign, and my Disney job…and when I list them all like that I feel like I need a nap. 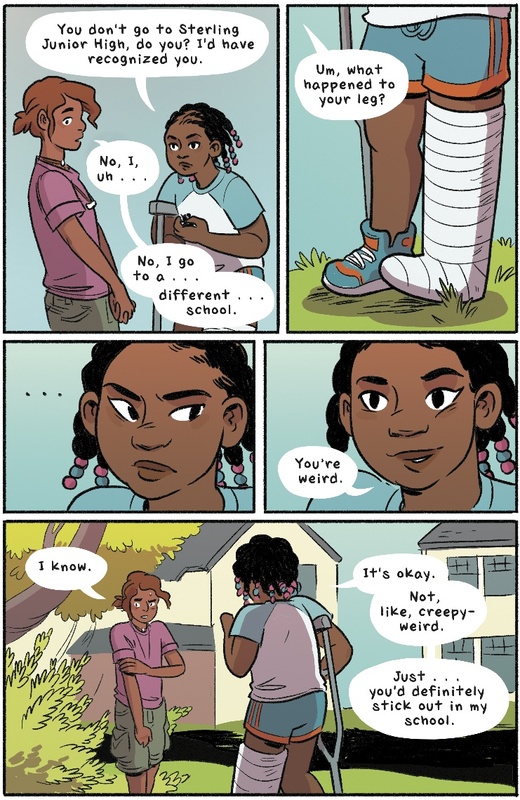 The book is, as your bio notes, your middle grade graphic novel debut, and did making a story for a younger audience affect your choices or what you did? I’ve wanted to make stories for kids for quite a while! I read all my favorite books before I was twenty. Kids and teenagers have a passion for stories, and an open acceptance of them, that I think we slowly lose as adults. It was also important to me to have a positive message about gender identity, nonconformity, and acceptance for a younger audience who might need to hear it. How did you pick the color palate for the book and decide on that feel? I love color, both for how expressive it is and because it’s the last step of a comic, the moment when you see it finished. I have a few color themes throughout the book – Aster’s color is purple, gold and yellow are colors meaning home, and red means danger. There are a few sections that are entirely in red tones, and I really like how those look when you flip through the book. 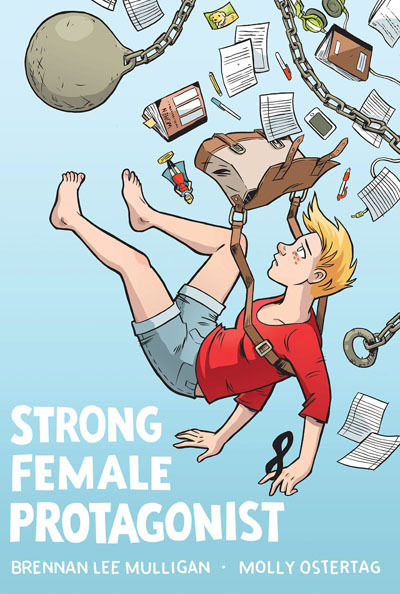 There’s also a second volume of Strong Female Protagonist coming out next year from Top Shelf, do I have that right? Yes! Spring 2018, although our Kickstarter backers will probably have gotten their books by the time this interview is out. Anything else you’re working on or thinking about that you’d like to mention? Two things! First, I’m happy to say that this book has been optioned for film by Fox Animation. I was so thrilled that a big studio would want to make something out of a story like this, and I’m excited to see where it goes. 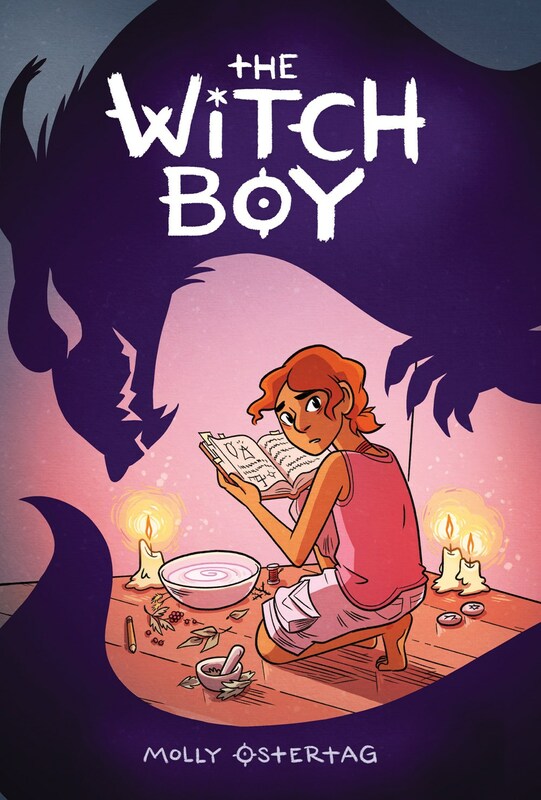 Second, I can officially say that there’s a sequel to The Witch Boy coming out in fall 2018! It’s called The Hidden Witch and deals with Charlie and her school, a mysterious curse, and Aster’s continued education in witchery.